How to add watermark to video and add more special effects? Why is it important to watermark MAC videos? There are so many famous products by Apple Inc., such as Apple II, MACintosh, MACbook, iPod, iTunes, iMAC, iPhone, iPad etc.. At present, those great products made Apple Inc. the first-class listed company with top market value. No matter mobile phone, tablet computer or PC, MAC has taken a large part of the whole market, that’s why we inevitably encounter the problem that came for the video transfer and sharing among various media devices and MAC. 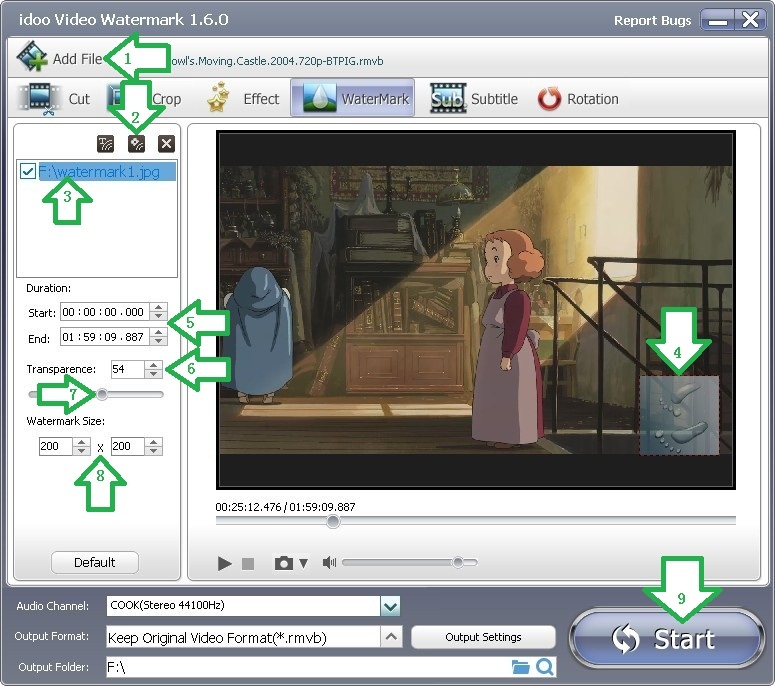 Luckily idoo Video Editor is your ideal solution. And it is the best free watermark software for MAC. For most users, it is an elementary job to add picture watermarks to videos. However sometimes we ask for more: to add various watermarks in various positions, to show different watermark at different time, or to add special effects to them and so on. 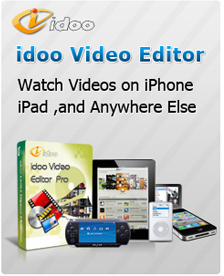 It sounds complicated, while by idoo Video Editor it is a real easy job. The following part will tell you how to add picture watermark to video and get more advanced effects. 2. Click to select a picture in your PC to add it as watermark (Arrow2). You may add more than one. 3. The picture info is shown below (Arrow3). Dragging the picture in the preview box to change its position (Arrow4). 4. Set the start and end time in Duration box (Arrow5), with millisecond precision. 5. Set the transparence in Arrow6 area, or to adjust by dragging the slider below (Arrow7). 6. Edit the size of the watermark by adjusting the figures in the box (Arrow8). 7. Click “Start” (Arrow9) to begin editing. Then to check the output file or edit it. How to preview the videos when add the watermarks, and how to convert them into the format we want? How to add watermark to video and add more special effects? How to create a watermark and more special effects to video? How to watermark an image by time settings? How to add batch watermarks to video? How to watermark video? How to add watermark to video? how to cut wmv video? how to cut MP4 video? How to convert and split video for MAC? How to split audio from video? How to split AVI video? How to split movie by idoo video editor? How to split MP4 video files according to the time span?